Do you reward yourself for your achievements? Many people lack motivation when working for themselves or striving towards their goals because they do not realize the importance of rewarding themselves. When we are in full time employment, we are rewarded with a salary for work done. If our work is exceptional we sometimes receive bonuses, another reward. Employers know that rewards are a great tool for motivating employees. 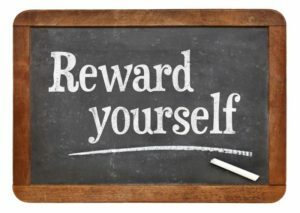 An employee who receives a reward often feels good about themselves and realizes that it is their efforts which are being rewarded, they are also more likely to want to put in more effort in future. A reward often acts as a reminder that your hard work has paid off. you have a long term goal you should break it down into smaller, more achievable short term goals and reward yourself for achieving each of them. The reward does not necessarily have to be financial, it could simply be a long hot bath, as long as it is something which will make you feel good about your achievement. Let’s say for example that you are training to run a marathon. The long term goal would be to finish the marathon. In order to achieve the long term goal you would need to increase your fitness and stamina, therefore it is essential to set specific short term goals which will help you do so. Perhaps you could target yourself to run a mile twice a week, increasing the distance by half a mile each week. Many people stop here when setting goals, not realising the benefits of rewarding their achievements. It is easy to say “I’ll skip it tonight” or “I’ll do two miles next time.” Many people fall into this trap because the achievement of the goal is not an incentive for all the hard work put into achieving it. A reward acts as an incentive, if your goal is to run a mile, maybe you could reward yourself with a new pair of training shoes. Once you are running five miles you may buy an MP3 player so you can listen to music while you run. As your fitness increases you will be able to run longer distances, reward each milestone to stay motivated. You must also set an appropriate reward for your long term goal. For finishing the marathon you could book a weekend away with your partner in a nice hotel. We all want to achieve our goals, however, we sometimes need a push in the right direction. By rewarding yourself for each goal reached, you will stay motivated and increase your chances of success. Next articleHow Much to Eat at Each Meal?